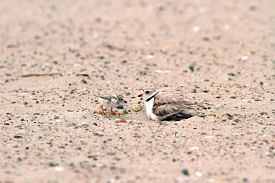 Summer has finally arrived in the South Coast as masses of beachgoers descend upon the state park beaches of Bristol County, where the Lloyd Center enters its 29th season of protection, management, and monitoring of endangered Piping Plovers (Charadrius melodus). Protection under law and recovery efforts have resulted in major increases in plover abundance along the Atlantic Coast through the years, but challenges remain, especially at high-use beaches such as Horseneck, Demarest Lloyd State Park, West Island and Gooseberry, where our efforts have been focused since 2003. As we near July when beach season really kicks in, the sands are bustling with activity. Plover hatchlings are crossing beach towels, hiding in footprints, scaling cobble, crossing roads, and climbing steep dunes. Pairs losing their initial nests or broods to predators are scraping away, sitting diligently on their second clutch, or have just laid the first egg of their re-nest. Angry least terns are on the attack in defense of their colonies as first hatchlings have emerged. And through it all the onslaught of humanity and predators (both natural and attracted to human use areas) remain a force to be reckoned with. So what happened this past spring? Unlike the previous two seasons where recent tropical storms created new potential habitat, no storms took place. This combined with the recently created beach areas becoming more densely vegetated, left slightly less available habitat than last season. The layout of plover pairs at least initially attempting to nest are as follows: West Island (five – six), Demarest Lloyd (six), Horseneck (nine – ten), and Gooseberry (one). This is quite similar to recent seasons, with many pairs attempting to nest in similar locations to last year. The intrigue early on was in actual birds present on the beach during spring, including the Snowy Owls! The irruption that brought so many Snowy Owls south raised some concerns as these predators lingered on plover beaches including Horseneck through April, but fortunately no known owl-induced plover mortality occurred. At Demarest Lloyd, a nesting plover pair includes a banded bird (details pending) which was marked over the winter down south. Unfortunately this pair suffered two predated nests, we are hopeful that they will remain for a third try. For the first time, we have Killdeer (Charadrius vociferous), a common, wide-ranging shorebird in the plover family known to nest just about anywhere open ground exists, nesting in shorebird refuges at Horseneck and possibly Demarest Lloyd. This may be indicative of the close proximity of sites in Bristol County to rocky and paved areas, where the Killdeer might be more apt to nest. Regarding challenges to nesting, weather has been free of storms that damage fencing and overwash nests. No major conflicts between people interests and plover protection have occurred thus far, with plover nesting and human use far less intertwined than recent years. At West Island, a pristine portion of beach remains open for public use and dogs are permitted provided they remain controlled and don’t disturb the birds. Five nests have occurred on town property, which reflects both optimum habitat and sufficient fenced area for pairs. A new late nest was recently discovered on the DCR portion of the island. At Horseneck, only one pair has nested on the main public beach and although pairs have scraped near facilities beyond the road, a nest is yet to occur. This is due mostly to optimum habitat present in the dune areas. For the most part, nesting in dune areas is desirable, as less conflict with beachgoers and park operations occur. However, road crossings by plover and tern hatchlings still occur, and due to the plover hatchlings the closure of a lesser used road has occurred. Predation rates in dune areas can also be high. Thus far, predators have indeed made their presence known for both eggs and hatchlings, with crow leading the charge for plover egg predation. We’ve lost eight nests (one at Horseneck, four at West Island, three at Demarest Lloyd) to predation, and two to nest abandonment for exclosed nests probably visited by a curious predator (Demarest Lloyd State Park). Of the predated nests five were lost to crow (three at West Island, one at Demarest Lloyd State Park, one at Horseneck), one to grackle, one to coyote, and one to skunk. At Demarest Lloyd three broods of hatchlings are present and more hatching ahead, so a strong finish is expected at this site. Things are less stable at West Island where only two nests are active and hatchlings are yet to emerge. Predator exclosures remain scrutinized and sometimes are omitted on beaches like West Island, where all were abandoned last year. This came with a price this season as predators found even the most hidden clutches. But we’re hopeful to at least equal last year’s outcome, where two nests ultimately hatched and some fledging occurred. Hatchling losses at Horseneck have occurred again in the cobbled east dune refuge from some predator, with only one hatchling from an original twenty-eight in the east dunes currently surviving. However, between the main beach and west dunes, we’ve got another ten hatchlings alive and well, with at least two more nests to hatch. We’re hopeful for a strong finish at Horseneck for plovers, and much better productivity than the past two seasons. Fortunately, we have the least terns at Horseneck as well, where the colony exploded to more than eighty pairs this season on both the east side where plover hatchling predation is high, and a few nests near buildings. The least tern colony has made its presence known, as any visitor who ventures too close can attest! They defend their territory vigorously, which provides extra protection to fenced refuges containing plovers, and also offers a highly visible spectacle less possible for the quieter plovers that are harder to see. The tern colony is surely a response to the great success these birds had last year, and we look forward to the emergence of all the hatchlings and fledglings again this season. At Demarest Lloyd, a colony of about thirty pairs goes strong as well, and terrapin surveys are underway with the first turtle spotted. With luck some nests will also be discovered over the next month. As always, we take this time to thank interns Meagan Rafferty-Jones and Melissa Benjamin for their many field hours on the project thus far! Stay tuned for further updates later in the season.